84-inch trestle table extends up to 120 inches, offering casual farmhouse style on a grand scale surrounded by 6 splat back chairs. 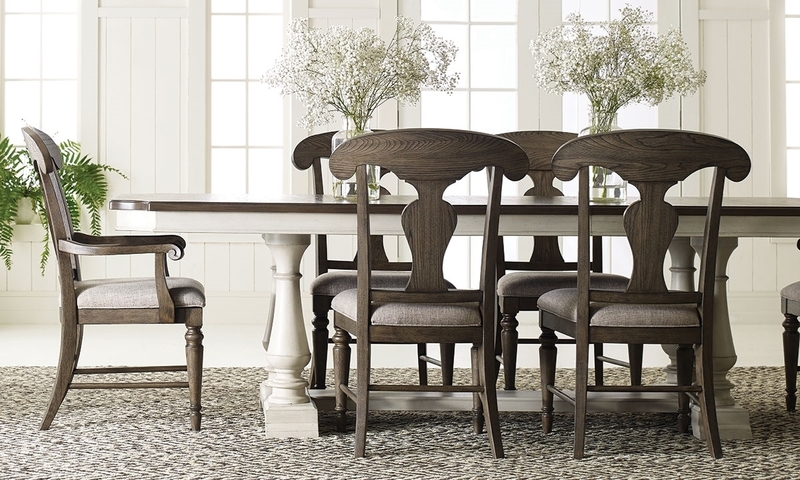 With its ability to extend to a stunning 120 inches, the Brookhaven dining collection creates a comfortable and inviting space for up to 10. A trestle base in a slightly distressed vintage linen finish offers an airy contrast to the table’s shaped surface of dark, rustic elm veneers. That same warm tone is carried over to the four side chairs and two arm chairs included in this set. Each flaunts a traditional splat back and timeless turned front legs, as well as a seat cushion upholstered in neutral fabric. Farmhouse-style dining set offers everyday elegance with a two-tone trestle table that extends to 120 inches and 4 splat back chairs.